APR Tuned 3.0 TFSI Accessories AUDI - Dezod Motorsports Inc - Home of the automotive performance enthusiast since 2002. APR is pleased to present a completely reengineered supercharger Coolant Performance System (CPS) for the Audi B8 3.0 TFSI. Through extensive motorsport testing in GRAND-AM Road Racing, APR’s Engineering Team discovered the OEM supercharger cooling system was inadequate at higher boost pressures and power levels and therefore developed the APR CPS to improve both performance and reliability. Compressing incoming air such as all superchargers and turbochargers do to deliver increased volumetric efficiency and thus more power at every point of combustion creates heat that must be properly cooled again prior to entering the cylinders. Most all automotive enthusiasts have experienced this with even normally aspirated cars whereas in the cool winter days our cars clearly perform better than in the hot summer months. 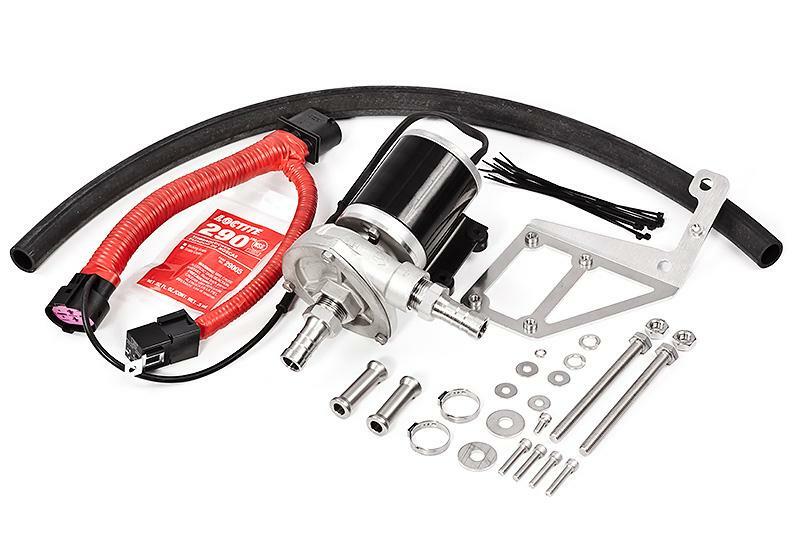 When increasing engine power or during spirited driving, and especially during brutal motorsport racing, the OEM supercharger cooling system quickly becomes taxed, creating a loss of engine performance. Heat is a major concern regarding the health of your engine and APR pays close attention to reliability. The engine’s ECU takes many steps to reduce power output when temperatures rise, however it can only go so far. By reengineering the supercharger cooling system, APR is able to not only keep performance consistent but also ensure your engine is more reliable by having done so. APR is pleased to present the world’s first Supercharger Pulley and corresponding ECU Upgrade for the 3.0 TFSI. Without recalibrating the ECU found in Audi’s latest line of supercharged direct injected vehicles, pulley upgrades offer no advantage, as the supercharger will simply bypass boost pressure. With APR’s ability to expertly recalibrate the 3.0 TFSI Engine Control Unit, we are able to develop new hardware and calibrate the ECU to work properly as if intended by the factory. Many enthusiasts coming from Audi’s history of turbocharged vehicles expected massive increases in torque, at lower RPMs, simply by adding an ECU Upgrade. Unlike turbochargers, roots style superchargers are positive displacement meaning they provide a fixed amount of air flow based on engine speed. On the 3.0TFSI Audi chose to use a bypass valve that bleeds off boost pressure when requested. Keeping the valve almost completely shut at lower RPMS allows them to make respectable torque, and, opening the valve at higher RPMs allows them to keep horsepower within their marketing goal. Consequently, the APR Stage I ECU upgrade provides a relatively low increase in torque but an exceptional increase in power. For those demanding more torque, The APR Supercharger Pulley Upgrade is the answer. Spinning the supercharger faster increases air flow and effectively doubles the low-end gains of Stage I. The gain in torque is felt immediately, but the results are present from beginning to end adding up to 80ft-lbs and 108 horsepower at all four wheels! APR has chosen not to cut any corners and as such each APR Supercharger Pulley Upgrade Kit includes a new supercharger belt. Furthermore, all existing APR Stage I ECU Upgrade customers are entitled to a free APR Stage II+ ECU Upgrade required for proper functionality. Finally, every APR Pulley is E-Coated black for an OEM appearance.